I originially wrote this for my friends but am putting it up here too in the hope of spreading the message more widely. 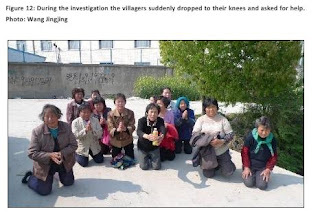 I would like to pass on to you a request from Chinese NGO the Institute of Public and Environmental affairs (IPE) and the women of Tongxin village. Please don't buy electronic/IT gadgets from Apple, and please write to both Apple and the supplier of the gadget you buy instead, explaining that you are boycotting Apple because its factories are poisoning people in China. Kiwis can contact Apple here, and the international contact is here (you'll need to click on the actual item you would have bought before you can give feedback). The IPE hopes that this will pressure Apple into having a transparent supply chain (so that complaints regarding the actions of its suppliers can be made to Apple), and that the suppliers will thus be able to be required to protect worker safety and the local environment. I was first made aware of Apple's record in China by this interview on the bilingual website China Dialogue. In it, Ma Jun describes the work his organisation has done tracking down the various companies that supply Apple, as well as those supplying many other major Western IT companies. They have produced a report [pdf] on both the openness of these Western IT companies to investigation and their responsiveness to reports of environmental violations by their suppliers. Their investigation found that Apple was the most secretive and had the worst environmental and worker safety records of all the companies examined. They are thus asking consumers to boycott Apple in order to pressure them to do better. The report also includes a table ranking all of the IT companies examined. This report appears to be reputable. It was picked up by both Reuters and the Associated Press and the spokesperson for the report, Ma Jun, is a former South China Morning Post journalist and was named by Time Magazine as one of the 100 most influential people in the world in 2006. To finish, a story from the report that helped me to see the human face of this 'environmental pollution'. According to the villagers’ comments, Tongxin village was a once a prosperous model village. Ten years previously Kaedar Electronics [an Apple supplier] constructed their plant, occupying the arable land and giving the villagers very low compensation. According to the villagers, in these ten years, the village’s stream that once had relatively clean water has now turned inky black. In the past few years, these electronics companies have been discharging wastewater and emitting waste gases, along with noise pollution. Over the ten year period, many people have fallen sick, with a sharp increase in the village’s cancer rates. The villagers had hoped to take this matter up with the factory, but they could not find a means to do so. They have reported the problems to the local government but the company seems to very quickly become aware of this and so before someone goes to carry out monitoring at the factory, the smell often disappears.